I guess I always remember that usually talk about the aurora, but never speak to you color them. 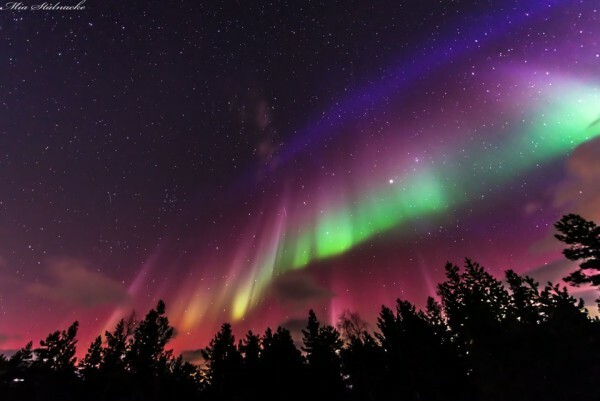 Quickly, auroras are caused by the Earth’s magnetic field (in our case) and energetic particles from the Sun interacting making the atmosphere is ionized and show these beautiful colors. Well, the colors depend on the composition of the atmosphere, so, for example, green colors are generated in the lower parts of the atmosphere while the red in the highlands. While greens are due to the high concentration of oxygen with nitrogen, the Reds must precisely at that point there is less oxygen, ie, by low concentrations of oxygen. Remember that not all weigh the same gases and therefore our atmosphere is made “layered” in the sense that there are different densities and different composition within it. The violet or purple auroras are not clear. That is, its origin is not clear but it is speculated that the highly excited nitrogen and oxygen by high energies. Come on, when the solar peak is very high. Its height is variable. There is also a blue color that is not in the image originated lower than the green itself (at lower altitude) because there is much more nitrogen than oxygen (remember that mainly we breathe nitrogen, contrary to what they say to us, although the compound is most needed oxygen). Nitrogen is ionized before the oxygen and this results in color. There are also mixtures of colors because, like a glass of a tonic, gases may be mixed. So there are mixed yellow green and blue by the different concentrations spoken before. In the background, the color depends on ionizes first on that for which the predominant color. That depends on the gas (composition) and energy it receives.